Okay, I've been seeing gift guides all over the internet. I really couldn't help getting in on the action, but with my own little spin. So here is my gift guide for a few of the biggest fandoms. I won't hit them all (you'll see that I'm missing two demon fighting brothers, and a brilliant British man with a purple shirt, for example), but I tried to get some ideas for what I thought were the big six. If your gift-getter looks up every time they see an owl, hoping it will drop a letter, or has dreamed of hanging out in the Room of Requirement, then this is the section of this guide for you. First up, Hogwarts pride. Looking beyond the typical uniform, here's a few pieces of clothing that will brighten their day. Try this Triwizard Tournament hoodie, or this Hufflepuff jersey (or anything from Black Milk's Hogwarts line), or maybe this Sweatshirt with the Hogwarts Crest. Or perhaps a more subtle nod to their Hogwarts love would do, making this House Scarf the perfect choice. Maybe clothing isn't just your style. The Marauders Map would be a great gift, because not only is it one of the handiest tools for getting around the castle, it also just plain looks cool. Or you could give them this beautiful Time Turner Necklace. Or maybe they'd like a cool iPhone case. Here's one with a ticket to the Hogwarts Express or this one with a Hogwarts letter on it. Of course, you could always make all their dreams come true by giving them a Hogwarts Acceptance Letter, no matter what age they are. Or maybe get them tickets to go to the Wizarding World of Harry Potter, so they could visit Hogsmede for themselves. If you're looking for a more DIY gift, try this tutorial for making a tea cup with a grim in the bottom of it. Or maybe you could just make them a customized wand. 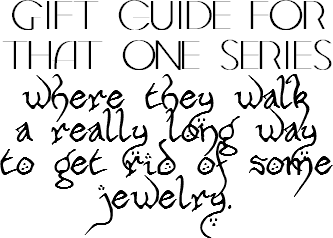 If your gift-getter has sat through all the extended editions of the Lord of the Rings movies at one time, or can name all of the dwarves from the Hobbit, then this section of the guide is for you. Well, lets start with the basics. You could get them the ring, modeled after the prop from the movie, or a gorgeous set of beautifully bound books, or this lovely edition with all of the books in one. If your gift-getter flinches whenever the words "red" and "wedding" are used in a sentence together, or often tell you morosely that winter is on it's way, then this is the section for you. Taking this title way too literally, here's a game. Of thrones. Or boards... or you could see if this guy would make another jaw-dropping RISK Game of Thrones edition. Or maybe you'd just like to get them a set of GoT Lego mini-figs. There's also this super-cute terrarium, but I digress. For some reason this series goes hand in hand with drinking in my mind. To celebrate that, here is a House Stark tankard. Or perhaps they would rather have a mug made out of horn. There's also these gorgeous coasters that mimic the house seals. And I didn't forget clothes. Here's a sweatshirt that represents all of the houses, or a shirt that really might be the worst ever created. Or Hodor. 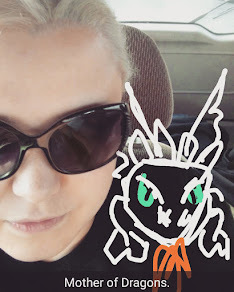 As for DIYs, I found what is probably the most epic lawn chair you could ever create, and a tutorial for making their dreams come true with their very own dragon egg. So I hope this helps you. Check out Part Two, where I talk about gifts for fans of Doctor Who, Star Trek, and Star Wars.